It's his first ranchero album and you can see how happy it makes him. Luis Miguel feels and breathes México, it's under his skin, and now, at the best time of his life, he renders a much awaited homage with a recording that brings him back to a style all his own after a short-lived stint through pop music. During the presentation of 'México en la Piel,' (México Under the Skin) the Mexican singer boasted of that patriotism that runs deep and defended the need to bring back the old classics and make them known to future generations. "The idea is to bring back all of that worth while music, the great songs, the great lyrics. The same thing happened with the boleros that I am trying to record with mariachi. I want to salvage all of those great treasures and in some way make them available to future generations, so they aren"t forgotten," he argues. Looking impeccable as usual, although somewhat better than other times -- in fact, he says he feels better today than ten years ago -- the Mexican star met with the press to present a style of music he has felt a strong bond with since he was a child, since he was "born" into it and "grew up" listening to as with the bolero. "I have always sung mariachi live during my concerts because I like it, I enjoy it, for me it comes natural. And now I have the opportunity to do a whole album in this genre," he comments. And it seems that this album was just as desired by him as by his fans. After barely a week on the shelves the 13 rancheras from 'México en la Piel' are already at the top of the charts garnering him a golden record in Spain in only three days. Choosing the songs was a difficult task. 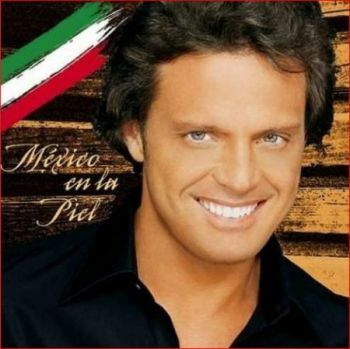 "It's hard to choose among beautiful songs," said Luis Miguel, who besides sin-ging also produced this project under the musical direction of Armando Manzanero, someone he collaborates with frequently. "We started with fifty songs and ended up with the 13," he explains. Accompanied by the Mariachi Vargas de Tecatitlán and true to the charro style, the Sol de México (México's Sun), as he is known worldwide, sings songs like 'El Viajero' (The Traveler), 'Entrega Total' (Complete Surrender), 'Echame A Mi La Culpa' (Blame Me), 'Cruz de Olvido' (Cross of Abandonment), and 'Que Seas Feliz' (Be Happy), and he identifies with each one of them, although that doesn't mean that they are autobiographical. "All the songs I sing have something to do with me, otherwise it would be very difficult to sing them. The songs that were chosen were based on what I feel and what I like to convey to my public," he states, "but in this case I simply try to do an interpretation of something already known." However, the one titled 'Motivos' (Motives) is the one closest to his heart. "My mother liked it very much. She always asked the mariachi to play it. It was one of her favorites, and that's why I recorded it," he points out. 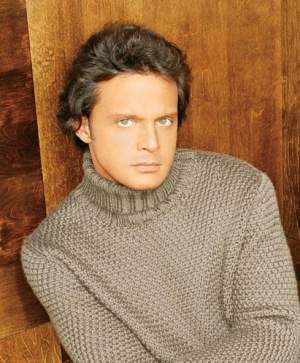 Son of Spanish singer Luis Gallego and the Italian actress Marcela Bastieri, Luis Miguel has always lived surrounded by the mystery shrouding his family, something he has never liked to talk about and has helped him create that image of tormented idol that mesmerizes his female fans. 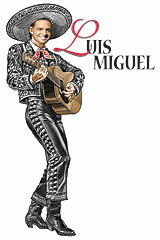 From his father he inherited his love of flamenco, a type of music he confesses he feels very attracted to, as by bulls. "I love the Spanish fans. The people are great. I have a lot of fun when I go on tour," he states. He has mentioned that his love of the language is what he holds dear from Italy, a language in which he might sing in again in the future, as he did when he was starting out. "Never say never," he asserts. "I don't dismiss the idea of recording an album of songs I like in another genre." For the moment he will keep mixing pop with traditional music, the two styles that have launched him to fame and have elevated him to the top of the charts all around the world. Just a month ago Luis Miguel ended his trek halfway around the world with his '33' tour, which broke attendance records in every capital city he visited, including México City, where he gave 25 concerts at the prestigious National Auditorium. "Sin-ging is therapy for me, a way to get rid of a lot of energy on stage, and it's something that becomes addictive and more so if you have been doing it since you were nine or ten years old," he admits. He smiles when he thinks back to that time and that child that was barely starting to make it as a singer. "I'm enjoying this as the years go by. They are treating me well. I feel a lot better now than I did ten years ago. I wouldn't trade any of the experiences I've had, because they've all been a learning process. The mistakes, the successes, they all happen for a reason. You never stop learning," he reflects. Someone the younger generation can look up to, Luis Miguel -- Micky to his friends -- feels everything he's lived through up to now has been worth it. "Success comes from working hard and having great discipline, there is no other way to get there," he advises. Zealous about his privacy, he doesn't like being deemed a Latin-lover and shows a little resistance in answering any sort of question having to do with the women that have shared his life and most of all about the one he is sharing his heart with currently, Cuban journalist Myrka Dellanos, with whom he has been romantically linked for over a year. "How would the mother of my children have to be? I wouldn't know. Love is something that comes, relationships happen, and one thing leads to another," he says elusively. At 34, the Rey del Bolero (King of Bolero) is facing the challenge of making those "lifelong" songs "last a lifetime." Now it's the rancheras turn and 'México en la Piel' is his first attempt.